I promised last post to write “The Precious” but my mind is wandering thinking about a pet I now miss. This is a post I have put off for several months even though I’ve wanted to write about it. I need to think about and absorb what happened. How about I lighten this story with Hanna’s humor then touch on the sad, heavy, thought provoking, controversial stuff later. Okay….. out it comes. Our one and only little kitty, Hanna, otherwise known as “Hanna Banana” passed on March 11th of this year. I call her little because she weighed 13 lbs at her heaviest. Most of our animals are huge in comparison. Sweet Pea weighing in at maybe 50 lbs by now and GQ weighting around 1200 lbs. Hanna’s death was not sudden. In fact I felt like I watched her die for quite sometime. I did not write about Hanna much since having this blog which has only been for less than 6 months. I ask myself if she did not impact me enough for me to want to to capture her but frankly she lived a reclusive and sedentary life. And you can only take so many photo’s of a sleeping cat. If you’ve seen my equine and canine photography it is about emotion and action. 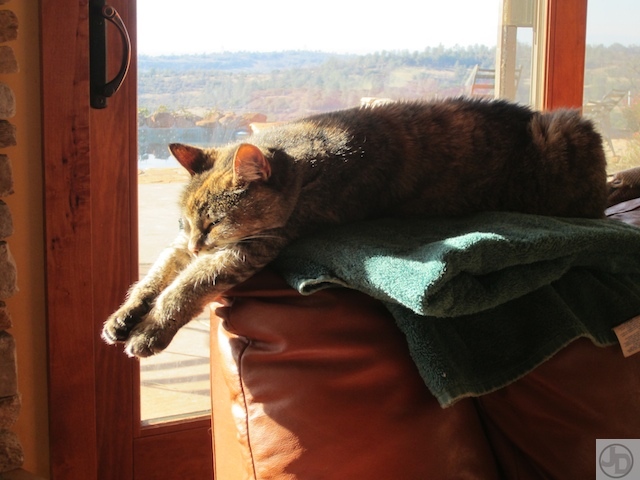 For most of her life Hanna was a ‘scaredy cat”. Living life in the farthest away bedroom she could find only venturing out for her required morning and evening feed. She planned it when the Sundogs were outside playing, on a walk or snoozing heavily. Sometimes her timing was off. 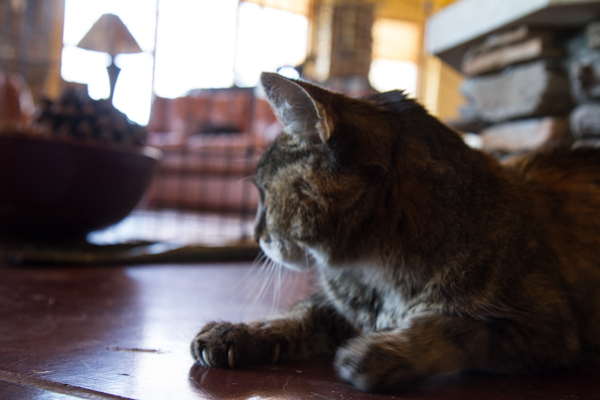 She survived several gut-wrenching chases up and down the stairs at our 2 story Moss Beach home and later in life down the slippery cement floors in the hallways at Sundog Ranch. The Sundogs learned to respect Hanna but there was something about a good chase. They could not help themselves. The Sundogs still have intact noses. Surprisingly Hanna became somewhat social and downright pleasant in the last couple years of her life. Maybe she instinctively knew in her cat like way that life was not eternal and she’d better take advantage of what life has to offer. She started allowing the Sundogs to come close without the usual nose swiping. Instead of the far away bedroom her hangout became a little ledge in the great room by the fireplace where I could watch her sleep while I cooked and watched the news or episodes on the Food Channel. She in turn kept her senses intact. She could hear kibble hit the pan, a can opener in action or smelly “Fishy Fiesta”. Once in awhile she would even hop up on our laps for some affection and NOT draw blood if we scratched her in the wrong spot. 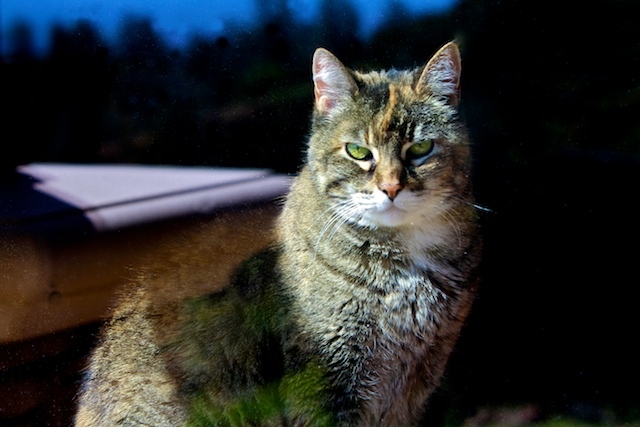 Hanna graced the planet for 17 years and lived life to the fullest every day. Even if that meant sleeping most of the time. Hanna slept in every possible position. In the warm afternoon sun on a early spring day she might hang out on the couch for awhile. But not were the Sundogs lay. These photo’s were taken at the end of her life when she decided to come out into the world and enjoy her surroundings. Speaking of surroundings, Hanna would do silly kitty things even when she was all grown up. 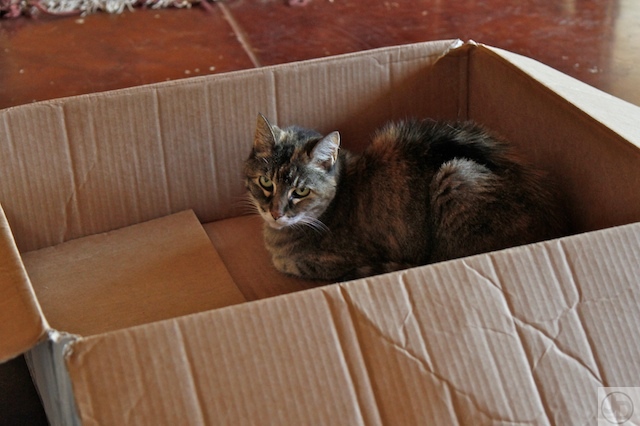 Like bedding down in this box for a few times a day until boredom set in. Then she went back to her usual hangout. 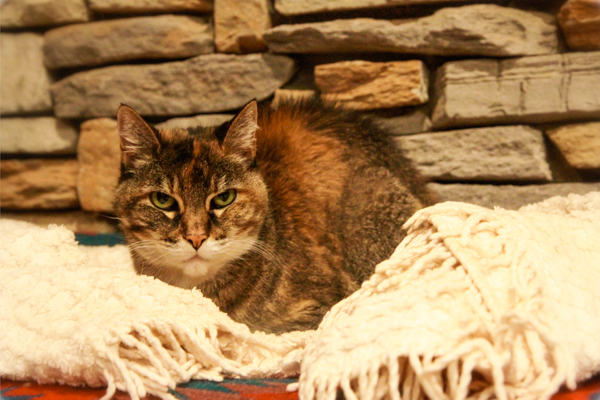 The ledge by the fireplace with the little white cotton blanket which was her last bed. I would roll the little white blanket up like a doughnut and she would sleep in the middle. I buried her in that little white cotton blanket. Now for the part I dread writing about but want to express. This photo was taken in the last hour of Hanna’s life. Being a photographer I feel I must capture life in any form at any time. I even have photo’s of the last week when my first, most precious Golden, Kelsey, died. To this day I have never shared “the last day” with Kelsey out of fear that someone would call me sick or gruesome to take them. Maybe if I get the courage up I can share that day. I think the photos show a natural phase in life. For now I’ll just reflect on Hanna. The ledge you see above Hanna’s back to her right is where her bed with the little, white cotton blanket was. She had jumped down off of it for the last time and just about collapsed. She wobbled and could barely stand. It is hard to witness any animal in this condition especially a cat. Her demise came on suddenly and I panicked a bit. I had a vet coming at the end of her work day for possible euthanasia if Hanna did not pass soon or appeared in too much distress or pain. For the last 6 months Hanna was in renal or kidney failure. Not unusual for a senior cat. Rockin’ Roy stayed out of my decision to let Hanna live or die. I let her live and I also let her go through it, death. For two years I did not let her go through it, death. I took her to the vet and did all the things you do for a pet to care for and prolong it’s life. Antibiotics, subcutaneous fluids, labs, etc. But towards the end Hanna was done with the needles and cramming pills and I was too. I decided to let Hanna sail her own course from then on. We dealt with the frequent LOUD, DEMANDING feedings and picky appetite. She got breakfast, second breakfast, lunch and second lunch, dinner was not so important. Oh…and it HAD to be canned Friskies “shreds”. We tried the wholesome natural feeds but Hanna only wanted canned Friskies “shreds, whatever flavor just NOT “pate” style. Fresh chicken or salmon worked too when ever she got lucky. Oh and let’s not forget the elephant in the room, the only thing I felt gave her discomfort. Frequent urination with bleeding and incontinence. Oh what a joy to deal with. Luckily for us we don’t have carpets or euthanasia might have come quickly. 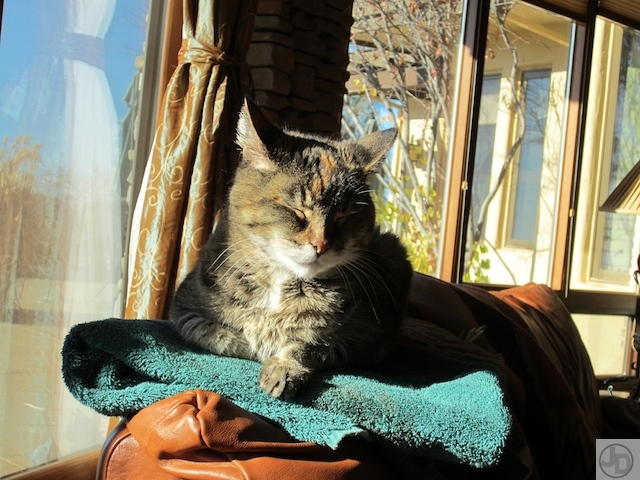 Despite the frequent urination Hanna was pretty happy up until a few days before she passed. She would sit up quietly, on her ledge, licking her paws after her yummy Friskies meal. Then she would settle down, curl up and slumber in her little white blanket bed near the kitchen. By now Hanna was unaware of the Sundogs. Warmth, food and a soft bed were all she cared about. And the Sundogs seemed to be aware of her need for solitude. Most people would likely take her in for euthanasia at this point which I feel is brave and courageous but I made the decision not to. I don’t think it was me being selfish and wanting to keep her around. I just felt she had lived a good life all these years on her own terms and was still living a fairly good life in her own terms so why not let her live out her life until the end. I tried to keep her healthy and alive but it was not working anymore. It was time to let nature take her course as awkward as that may seem these days. Boy that sounds weird. As a ICU and oncology pediatric nurse I have witnessed pain, suffering and death beyond imagining. In the human world euthanasia is not an option, especially with children. But we can put our animals down. Regardless of the human euthanasia issue I think it is a good thing most humans are compassionate enough about animals to end their suffering. People don’t want to experience that very end of life that can be peaceful but sometimes very unsettling and unpleasant. I felt I could help Hanna pass through death. This photo is of Hanna’s last stare. She could not focus on me at this point and seemed to be judging where she was on the planet earth. A few seconds after this she went off to somewhere I don’t know. There was nobody home. She was in limbo, dying and passing to the spirit world but still trying to move in her inhabited earthly body. It was then I had to put the camera down. 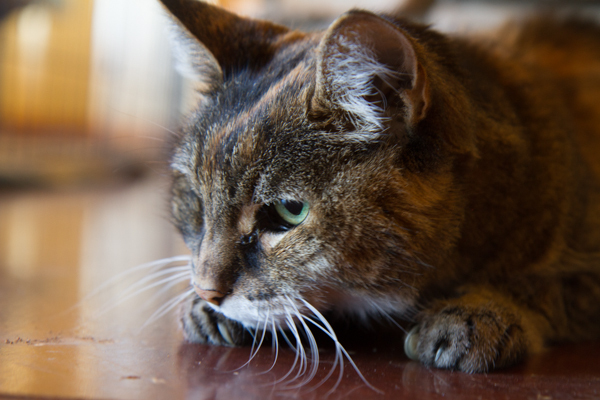 For a few minutes which seemed like an eternity I witnessed agonizing cat cries and gasps until her final breath. I’m not going to lie and say she died in peace. For a few seconds all I could do was cradle her head and body in my hands to soften the blows of her flailing body against the concrete floor. There was a body and that was all. Her spirit had left a few minutes before while she cried. After her last gasp of air immediately there was peace. I collapsed by her side and sobbed for her suffering but soon was crying with joy for her final peace. We wrapped Hanna in the little white blanket and buried her on the ridge edge under a blooming Redbud bush. She is far enough away from her former Sundog rivals Kelsey and Madison. This is not a anti-euthanasia story. I have HAD to euthanize three beloved pets in the last three years because it was the right thing to do. Did I do it too late? Did I do it too early? Did I do it in the right way? I hold those questions in my heart and mind for the longest time after one of my pets dies but luckily time heals and the hurt finally goes away. Death no matter which way it comes is not easy to go through. And we always keep missing them, but such is life. C’est la vie. Here is how I prefer to remember Hanna. This photo was taken about 6 months before Hanna’s death. 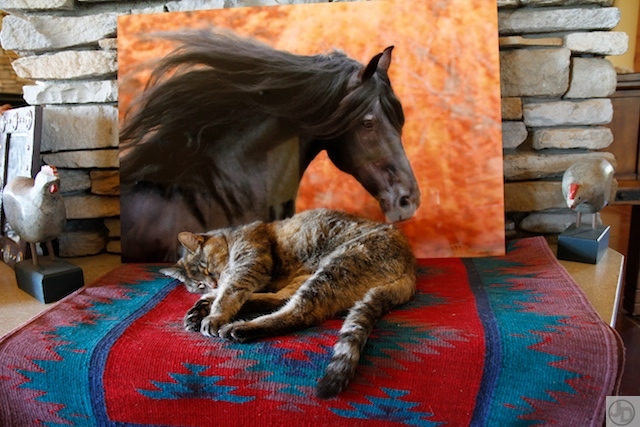 By this time her arthritis was settling in but as you can see even without the little white blanket she naps peacefully protected by “Knight Invader” a big beautiful black stallion. What more could a kitty ask for? RIP Miss Hanna Banana.